The 88th Academy Awards ceremony was held on February 28th 2016, but what do John Wayne and the Oscars have in common? That’s an easy one; they both got their big start in 1929. Although the Duke had some minor parts as an extra in 1926, his first credited film was in 1929: “Words and Music” (Musical Comedy). That was the same year the Academy of Motion Picture Arts and Sciences (AMPAS) held their very first Academy Awards ceremony at the Hollywood Roosevelt Hotel on May 16, 1929. 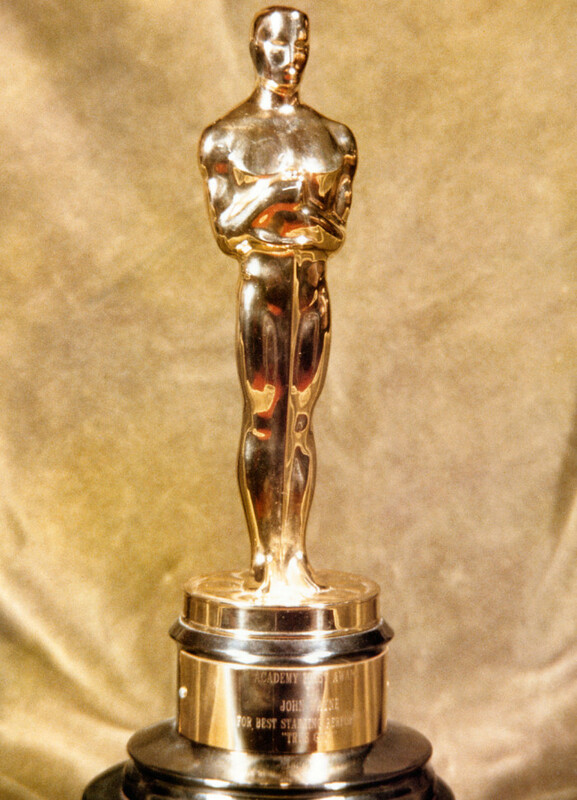 Louis B. Mayer created the ceremony and the Academy President was Douglas Fairbanks. “Wings” won the very first Outstanding Picture (now known as Best Picture) award. Only 12 Oscars were presented and 270 people were in attendance. The first Oscars consisted of a private dining affair. It cost five dollars to attend and the ceremony only lasted 15 minutes – notably different from the ceremonies of today which last nearly three hours and include not only award presentations, but has become a huge production. For me, the most touching part of the ceremony is the Memoriam where members of the Academy and film industry remember lives lost over the previous 12 months. We lost some great ones this last year including an actress known by John Wayne fans worldwide, Maureen O’Hara. John Wayne fans remember all the great films she was in with the Duke: from Rio Grande to Big Jake and who can forget everyone’s favorite, The Quiet Man. We also lost another familiar face to the John Wayne films, Gregg Palmer (not mentioned in the Memoriam). Palmer worked with John Wayne in several films from The Comancheros to The Shootist. “Wow, if I'd have known that, I'd have put that patch on thirty-five years earlier." The crowd burst out in laughter and applause. Duke had finally won the award he so richly deserved for many years. Despite winning one Oscar in his lifetime, fans worldwide continue to watch his films every day of the year. He has left his legacy for us to enjoy for years to come.